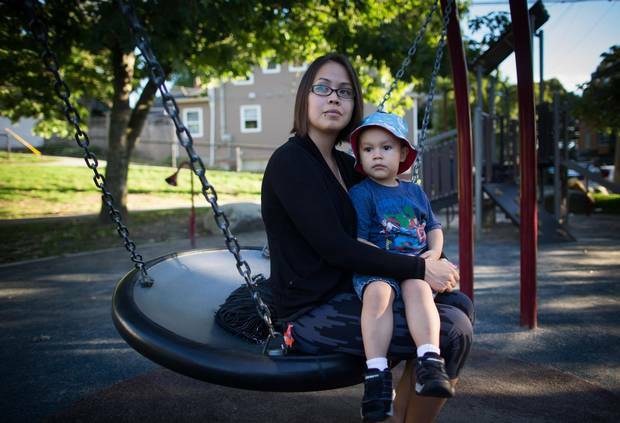 Crystal Saint Marie Howard sits with her son Ka’leo Stonechild, 3, at a park near their home in Vancouver. Her two great goals – to become a social worker, preferably with a master's degree, and to have a home, preferrably outside busy Vancouver – may be years away, but Crystal Saint Marie Howard works every day to bring them closer. As well as being a single parent to 15-year-old daughter Jade and three-year-old son Ka'leo, she is working toward a general arts degree and hopes to enter a social-work program next year. A member of the Mowachaht Muchalaht First Nation on Vancouver Island, Ms. Howard lives in subsidized housing and has had jobs ranging from supermarket cashier to general labourer, but now supports her family by working at a community centre and with funding from her band. "I think I am, like, lower middle class," she says. "I am not in the extreme poverty I was once in some years back." Still, life is a challenge, and she calls her many responsibilities a "10-person job." "Usually, I am over exhausted and sometimes my kids get blunt force of my tiredness, my crankiness and the stress," she says. She has voted for the New Democratic Party since she was 19 because of MP Libby Davies (who is not seeking re-election this year). "I almost feel like I am not being seen or heard as a human being by the Conservatives." Ms. Howard says the NDP's proposed national day-care plan "would make a substantial difference to families, relieving marital pressures, single-family pressures." Her son now goes to what she calls the lowest-cost licensed day care in Vancouver. Her parents, she said, have faced financial challenges in their senior years. Her father worked at a mill, and her mother has long been a First Nations activist. She thinks she will do better. "I want to have good savings. I don't want to just rely on the CPP [Canada Pension Plan] because I have grandparents that worked themselves to the bone. It's a pretty sad CPP that they get. I don't ever want to be struggling when I am elderly. I see a lot of elderly people struggling now." But prospering, she says, likely means leaving Vancouver, with its expensive housing and other costly services, perhaps to the Okanagan Valley. "I do want my grandchildren to come in the summer times. I do want a family home." 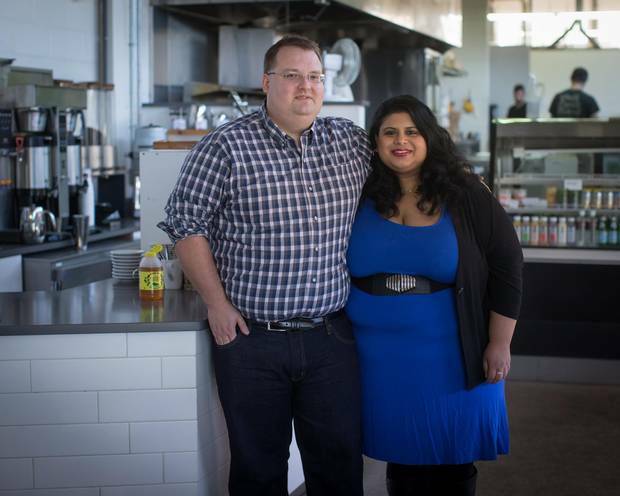 Jeff Salzsauler and Michelle Pinto are shown at an outlet of Vancouver’s JJ Bean Coffee Roasters, where Mr. Salzsauler works as a product developer. By most measures, Michelle Pinto and Jeff Salzsauler are doing well. She is a newly trained pediatrician, working in clinical research at a children's hospital while pursuing further studies at the University of British Columbia. He is a classically trained pastry chef, working as a product developer for a café chain and finishing a business degree at Simon Fraser University. They plan to marry and start a family in the near future, and say that back in Manitoba, where they are from, their salaries would be enough to support a mortgage and payments on two cars. Not so in Vancouver, where the average price of a detached downtown home recently rocketed to a record $2.23-million. "If we were still living in Winnipeg, we would be an upper-class family," Mr. Salzsauler says. 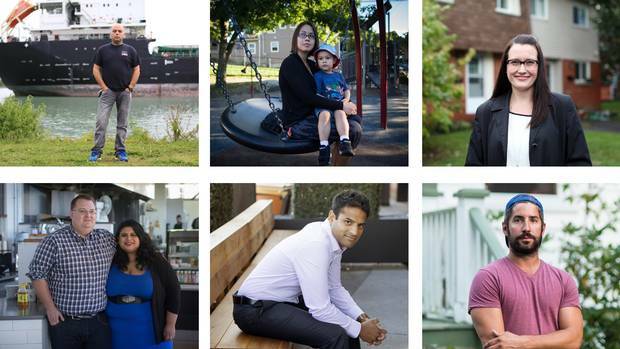 "But in Vancouver, we are very solidly middle-class." Dr. Pinto, however, defines middle class as being able to comfortably raise a family in a nice home, and wonders if they are even there yet. "We had the luxury, both of us, of growing up in large, detached homes with garages and parking spaces, able to have pets," she says. "These are things we think we should be able to offer to our kids." Now, with the election looming, the two have been educating themselves on the party platforms. It is no surprise that they are particularly interested in issues related to housing affordability and cost of living, along with health care and child care. Sunil Shah is a 32-year-old electrical engineer who works for a mid-sized engineering company. 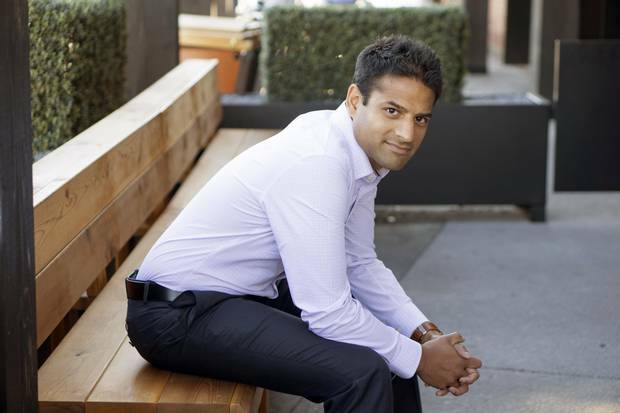 Sunil Shah works at a mid-sized engineering company, and is one of the many Albertans who prospered along with the province's energy sector. He's also lucky: his company's payroll was halved in the last year, as the price of oil collapsed. Mr. Shah and his wife, a doctor at Calgary's children's hospital, have done well, but "I don't think most people can define what the middle class is, including me. We sit at Tim Hortons on Saturday morning with our daughter. We don't drink bottles of champagne at home. I'm a normal guy, but my wife and I have two relatively high-paying jobs. What am I?" He sees the middle class as fitting within the standard "American/Canadian dream" of a house, white picket fence and two cars in the driveway. That's his life. He pulls in over $120,000 annually; his wife makes more. The son of an immigrant who arrived in 1970s Alberta at 22 and found a job at KFC, Mr. Shah was raised to value thrift. His father drove auctioned-off police vehicles and saved for his son's education – an opportunity Mr. Shah says he's obsessed with giving his three-year-old daughter. "I was telling my dad I don't know what my daughter will do in 20 years. He told me not to worry; he had the same fears and I turned out fine." Mr. Shah is worried about the current downturn. "I might have a very glass-half-empty view of life. A part of me is very frightful and a part of me is very optimistic … as long as there is a political appetite to move our resources to market, we'll be fine." A lifelong Conservative, he supports Stephen Harper's tough-on-crime policies, but isn't a fan of the child-care benefit the government expanded this year. "I'm grateful for the $520 cheque I got, but I prefer more of a broad-based income-tax cut. I know that isn't politically hot, but I want more pro-growth policies like lowering the income tax and corporate tax." His family spends $1,400 a month on child care, and says the New Democrats' $15-a-day daycare promise "sounds great, but it's a wealth transfer from people who don't have kids to people, like my wife and I, who have done pretty well." 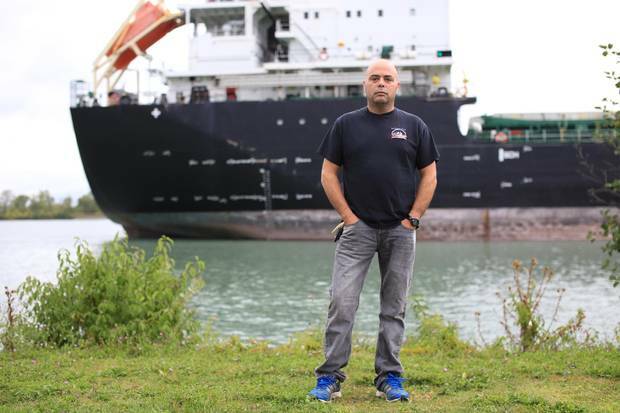 John Marsala, 45, stands beside the Welland Canal in St. Catharine’s, Ont., near the drydocks where he used to work. A juicy medium-rare T-bone was once a bi-weekly indulgence for John Marsala. But then he lost his $100,000-a-year job as a health and safety officer with a ship repair company in nearby St. Catharines. (More than 100 employees were thrown out of work when the city's dry dock went bankrupt in 2013.) Now, steak is a luxury; the weekly allowances that Johnny and Jenna, 11 and 9, receive have also been cut. As he watches full-time manufacturing jobs being replaced by short-term contracts, Mr. Marsala finds it hard even to imagine going back to the family's former lifestyle. Beyond the way his specific sector of the economy is handled, he says he doesn't pay much attention to politics and has grown disillusioned with all the parties. He considers himself to be middle class, but just barely. By his measure, a household must earn at least $100,000 a year to make the cut, and that's what he and his wife, Tanya, pull in between part-time jobs and contract work. They live in a nice neighbourhood in Niagara-on-the-Lake where detached homes sell for $400,000 to $1-million, but it's only because their house was already in the family – he purchased it cheaply after his father died. "If I had to buy a house and I didn't have this one," he says, "I wouldn't be nowhere near this area." Back in his parents' day, it wasn't necessary to have more than one breadwinner in the family to live a comfortable middle-class life, Mr. Marsala says. "Now it seems like you need both people working, both full-time jobs, just to keep afloat." He doesn't imagine things will be much easier for his children. It may even be worse, with the wide availability of credit, which comes with the temptation to borrow to maintain a certain lifestyle. In the last two years, more pressure has fallen on Tanya. 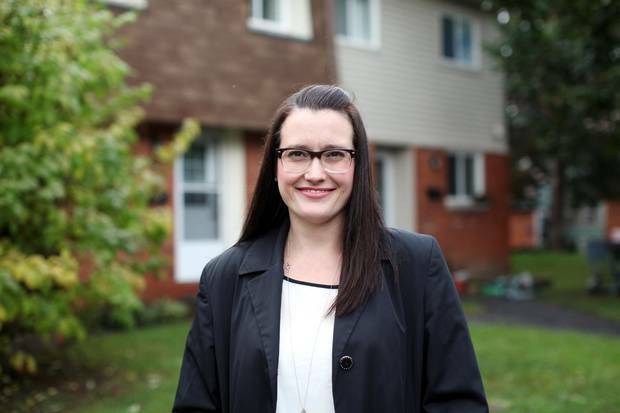 She used to bring in about $30,000 annually from her part-time job at Wal-Mart, and now juggles that along with shifts at a jewellery store and a gym while her husband searches for work. He once dreamed of retiring at 60 and geared his registered retirement savings plan to that goal. Since losing his job, he hasn't made a single contribution. Erica Lychak stands in front of her Ottawa home. Erica Lychak ticks a lot of the boxes often used to define the middle class. She has two degrees, a white-collar job and a home in the nation's capital. But there's also a precariousness that makes her wonder just where she fits in this demographic. "I would probably say I'm lower to middle class," she says, financially sound unless "there's anything sort of out of ordinary … that comes up." A financial services officer at the Business Development Bank of Canada for more than four years, she earns well above Ontario's median income, but says being middle class is to enjoy a sort of stability, a comfort level somewhere between poor and rich – beyond the stress of living paycheque to paycheque. This status is becoming harder to achieve, Ms. Lychak feels, in part because of an arms race of qualifications among job-seekers chasing even low-level positions. And she worries that easy credit may increase the risk that debt may drive people out of the middle class. In her own case, she worries enough about carrying a home on a single income that she took out insurance to help with the mortgage if she can no longer work. Now, three years after buying her house, that pressure will be reduced – she is getting married. As politicians stump for votes, she hears little that is relevant to her. Instead, the parties seem to be aiming at either young families or older people. "There's a lot of us sort of in between that – if we don't have a label, I'm not sure that, you know, there's much that really applies," Ms. Lychak says. What would apply? She stresses that she's keen on good financial management, and interested in help for people carrying substantial student debt, plans for addressing climate change and, possibly, tax relief for single people. Bala, as he's known, realized that opening a small business would be a challenge, but not how cutthroat the competition on Montreal's Park Avenue could be. "I was open nine months when the store was firebombed," Mr. Sinnathamby says. There were no arrests, but the Molotov cocktail, police noted, is a favourite tool of Montreal's protection racket. Someone was trying to chase out the upstart, who'd arrived in 1988 as a refugee from Sri Lanka's civil war. Things eventually settled into a struggle that would go on 10 years: Cash flow was tight, often requiring loans from family and friends, the hours were long and the holidays nonexistent, not even to attend his father's funeral back in Sri Lanka. "You don't sleep normally when you run a business," he says. There was enough money to rent a nice $1,200-a-month, two-bedroom apartment on the fringe of Montreal's well-heeled enclave, the Town of Mount Royal. But his wife, Ranjeet Ranji, also worked at the store, so there was little time to help the kids with homework. The younger of their two children, Krishrni, now 16, went off to Quebec's heavily subsidized private-school system where tuition and fees usually run around $5,000 a year. By last March, the struggle was too much. A large supermarket opened just down the street, so Mr. Sinnathamby closed his store and spent the spring selling what he could of the shiny display cases, where oranges and grapefruit were once stacked. "I was working for nothing basically," he says. "I lost everything. Easily a half-million dollars were sunk into that business. But my family is happy, and I'm happy." He bought the store for $90,000 and, 10 years later, estimates that's about what he still owes those who kept him afloat. He took the summer off, his first vacation in more than a decade, and the family went on a driving tour of Ontario and Quebec (two highlights: Niagara Falls and Quebec City). This month he will start a new job in the food industry (he has a couple of offers) and is confident his knowledge of produce and the goodwill he fostered in the community will see him through. As for where he fits economically, he says that he has some middle-class aspirations, such as sending his children to university. But he also feels he may never own a home and his children will have to provide any comfort he'll have in retirement. As for the election campaign, he is not following it, even though he was a fan of Irwin Cotler, the staunch advocate for human rights now retiring after representing Mount Royal for the Liberals since 1999. But that was "more of a personal thing than a political thing," he says. As for now, "I owe people money – friends, family. They don't say anything, but I have to pay them." Ross Higgins stands in front of his parents’ home in Halifax. Like a generation of Maritimers before him, Ross Higgins headed west. It wasn't a romantic search for opportunity, but a scramble to pay the bills. 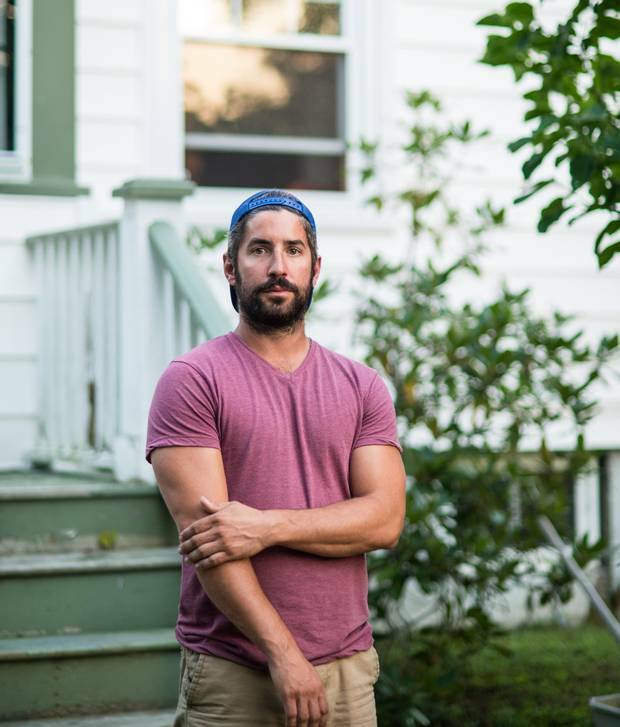 The 30-year-old tried to make ends meet on the East Coast after graduating with a degree in Atlantic Canada studies, but a groaning student debt load left him with few options. He soon found himself as an apprentice welder in the oil patch. After four years, Mr. Higgins returned to Halifax in May, a victim of the collapse in oil prices that has seen thousands in Alberta's energy sector lose their jobs. He doesn't consider himself a member of the middle class. "I don't see myself as disenfranchised. I got an education, but I had to pay for it. I got opportunities, but I had to work for them. I'd say I'm working class." In Alberta, Mr. Higgins set aside 60 per cent of each paycheque. After his $25,000 student debt was paid off, the money went into savings. Now he'd like a new truck and a down payment for a house, but is unsure of when he will find steady work again, so all large purchases are on hold. He says a single person can belong to the middle class, but it requires hard work and luck – in particular, having parents who help their children get ahead. "People who are born middle class seem to be middle class," he says. "The middle class is people who can go on vacation a few times in the year, but they have mortgages and car payments. They aren't living paycheque to paycheque, but they do need to work." The same applies to long-term planning and retirement. With friends stuck in the service industry long-term, and few purchasing houses or building equity, Mr. Higgins thinks millennials will be defined by thrift and a struggle to set money aside. Right now, he says, he is doing about as well as his parents did at his age: comfortable, but working hard to keep it. He's also aware of all the appeals to the middle class being made in the election campaign, and is most interested in the promise of change. Although leaning toward the New Democrats, he's also giving the Liberals a chance to earn his vote.